Need a good substitute for Dutch-processed cocoa powder (also known as Dutched chocolate, European-style cocoa or alkalized cocoa)? Here are three replacements that you can make from basic pantry ingredients. Pick one, and get your recipe back on track in less than two minutes time. All you need is unsweetened cocoa powder (natural cocoa powder) and baking soda. 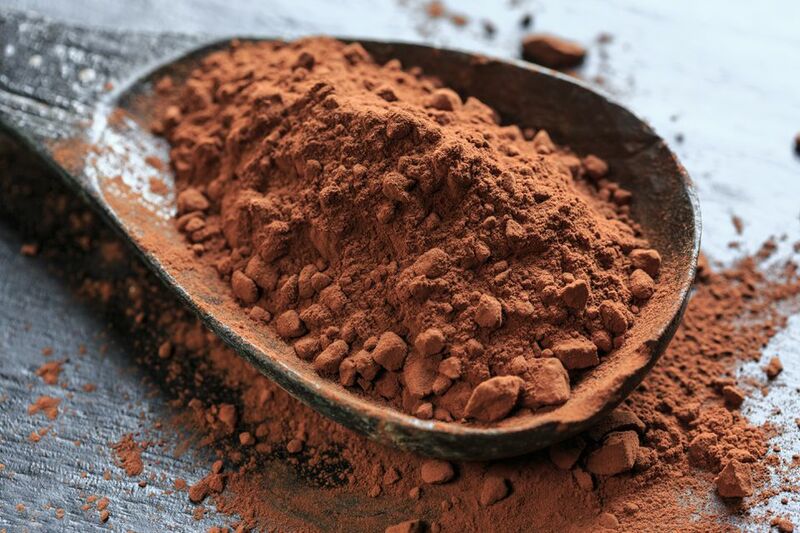 Replace the Dutch-processed cocoa called for in your recipe with an equal amount of unsweetened cocoa powder. Then, knock back the acidity by adding 1/8 teaspoon of baking soda for every three Tablespoons of cocoa powder used. Dutch-process cocoa is unsweetened cocoa that has been treated with an alkali to make it pH neutral. This gives it a milder, less acidic flavor, and a darker color. By adding baking soda (a base) to unsweetened cocoa, you are neutralizing the acid in the cocoa, so it doesn't interact unfavorably with the other ingredients in the recipe. With that small tweak, unsweetened cocoa powder should perform much like Dutch-process in the recipe, though the finished recipe may be a bit lighter in color. King Arthur Flour says that you can also use unsweetened cocoa in place of Dutch-process cocoa in a recipe if you replace the baking powder called for with half as much baking soda. So, that's a second method to achieve the same goal. Replace three tablespoons of Dutch-processed cocoa with an ounce of unsweetened baking chocolate, plus 1/8 teaspoon of baking soda for every three tablespoons of cocoa powder called for. This will increase the fat in the recipe, so it's best to only use this substitute if you'll be replacing less than six tablespoons of cocoa powder (the equivalent of 2 ounces of baking chocolate). If you alter the fat content in the recipe too much, it could affect how the ingredients work together, and change the final product in ways that you can't predict and may not be happy with. The only thing worse than wasted chocolate is wasted time, and this could waste both. Try to pick the right substitution for the job, so you'll be happy with the results. If you're working on a recipe that doesn't include any baking powder or baking soda, ice cream or pudding, for example, Dutch-process and unsweetened cocoa powder are much more interchangeable. Use an equal amount of unsweetened cocoa in place of the Dutch-process, and you'll find that your dish isn't quite as dark in color or as rich as intended, but still quite delicious. If you shop in a well-stocked grocery store, you should be able to find it tucked alongside the unsweetened cocoa powder. But, if not, it's readily available online. Be sure to store it in an air-tight container to preserve its quality.